My rear brakes(disc) are worn and I knew that next time the brakes are replaced I must replace the backing plate. It is rusted and its not just a dust shield but a structural part. Holds cables in. I know the backing plate is the same number from 1995 to 2001. 46503-20010, 46504-20010 right and left. $250 new a pop hence need it used. Aftermarket is high also. Went to boneyard and could not locate one. All cars had drums in rear. Also being in the Midwest all drum backing plates were rusted. I think this backing plate goes out to later cars > 2001 since the numbers changes but picture the same when you look at online oem parts. This will allow me to locate a new model, less rust. Your thoughts. All junkyards require you to buy whole hub assembly which is fine. Toyota doesn't change P/N without a reason. 2002 was a new generation of Camry. Is this the same part (see link)? Dorman makes aftermarket dust shields for some Camry. The Camry V-6 had rear disk brakes. Have you looked at Lexus ES 300 and Avalon. Avalon is an upscale V-6 Camry. For a time Lexus was built on a Camry chassis and used a lot of the same parts. Have you searched Craigslist for parting out Camry's? A local junkyard can't post on the network for the assy? It's reasonable common for Camry owners to change over their rear drums to disk and with this need to look for these units. I have searched craigslist and you are right other vehicles could have the same part and searched that in the yard. Dorman has it but $260 for two instead of $250 for one dealer. Your link is correct but it's the front one. I did find the part on ebay which comes with the whole assembly which is the only way they sell it. They have both right, left and free shipping and I think I can get it for $150. Also I will not have to take them off. The backing plates still have the paint on them since coming from California. Reluctant to look further since when at the boneyard every camry or camry related I check had somewhat rusted to severely rusted out back plates. I just purchased two rear wheel hub assemblies. 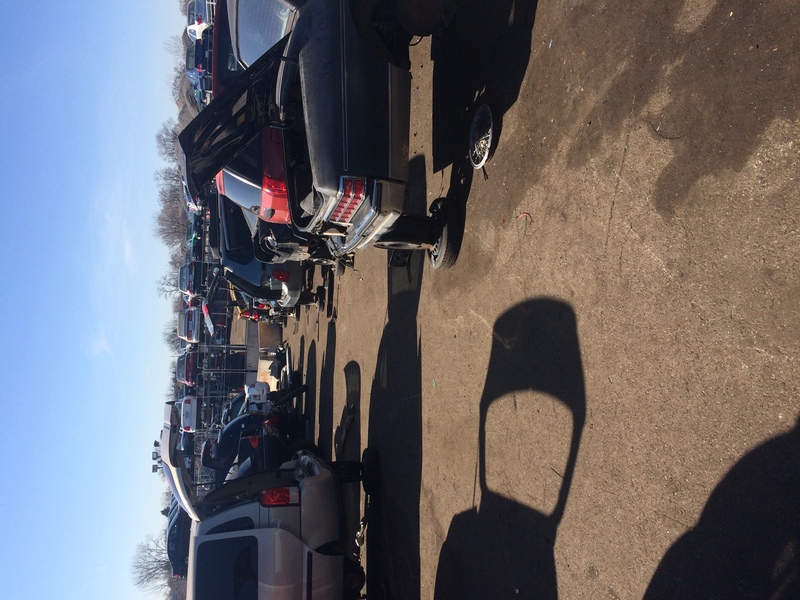 To buy backing plate must buy all which is normal for junkyards. It was $140 free delivery, no tax and did not have to pull it. The one I bought still has the paint on the backing platesince from California from an Avalon. Note: As Toyomoho said sometimes different models have the same part ( Avalon and Camry). I did check other junkyards that have the part off andsimilar price but condition not as nice. Much cheaper when pulled yourself but hard to do in winter. How hard to remove my old one or where will I run intotrouble? 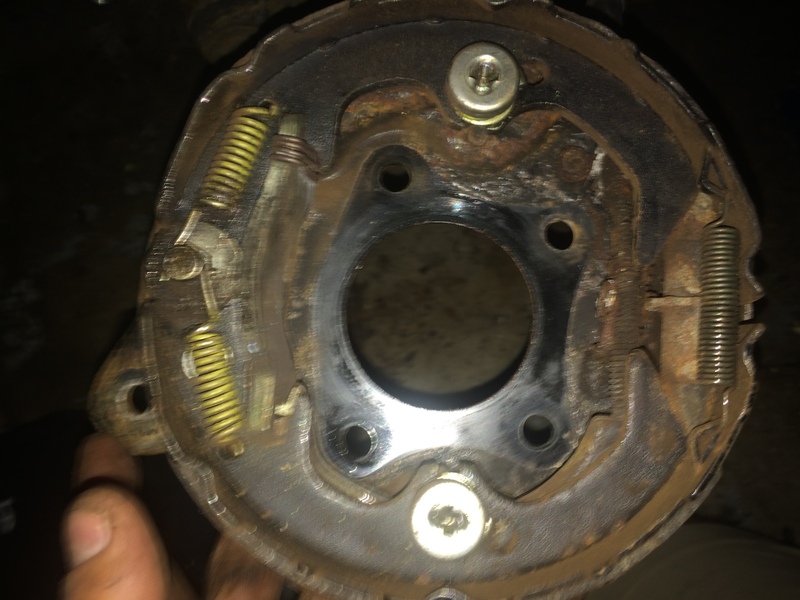 Remove tire, caliper, pads, hub ( 4 bolts), cables and itcomes off? I just received both rear hub assemblies ( hub, emergency brake, backer plate and knuckle). I took two apart in a half hour. Remember parts from California I expected to have very little if any rust on any parts should be easy to remove. That said the backing plate is a structural part and can be removed from the knuckle but it has those bolts that are pressed in and need to be cut. I will use the knuckle and the plate as is on reinstall since it is all in good shape. I think it is important to check on the backing plates on these type models( with discs and living in the Midwest) since if they rust out they hold the emergency cable in place so you loose that and possibly impact the rest of the disc brakes. Other backing plates just keep the dirt and stones out and easier to live with when they rust out. As soon as I have time will install. Waiting for brake pads, rotors, emergency brakes and bearings. Thanks for posting with the update. Just finished taking apart my rear axles. Time about 3 hours total. Actually longer since some parts had to be soaked in PB Blaster. Thought backing plate was part of knuckle and needed to disconnect suspension but it is not and made the job easier. Waiting on bearing parts, seals, etc. 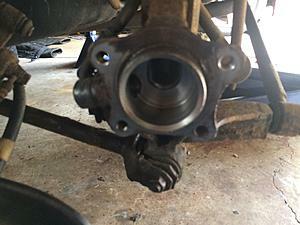 Removing hub nuts - some needed heavy soak with PBBlaster and let sit to remove. Used a breaker bar. My rears were making noise when braking so thought it was the brake pads but were not in bad shape. 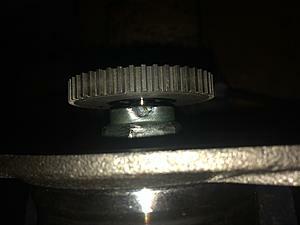 The bearings were noisy upon turning but one of my main purposes was to replace backing plate. I was going to replace the bearings since never replaced before. 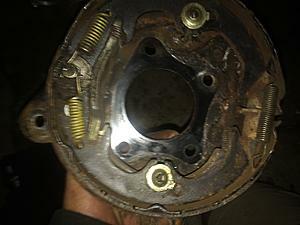 The backing plate was rusted and one of its purposes is to deflect all the dirt and debris from the rotor and pads. The rotors and pads have some definite knicks. Will clean with brake fluid and do a light wet sand. Just Finished and test drove locally. Rears making noise but since it took a while to repair and humidity high so rotors built up rust. Almost gone. 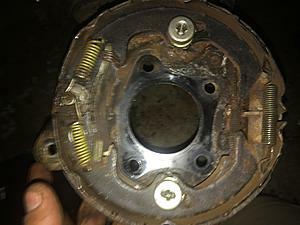 My goal was to install a backing plate ( rusted out and an intergral part of the rear braking system and protects dust dirt from getting in brakes) and replace bearing on the rear of my 1995 Camry LE 4 wheel disc v6 which may of been making noise. If backing plate gets worse potential loss of all brakes, bearing etc. in the worst case. I am in the rust belt and we love to use salt. 1. Use the manual as a guide since every car is different and take pictures , video as you remove parts. This is a complete teardown to knuckle. Use quality (2) 3 ton jack stands and 3 ton hydraulic jack as an example. These are $500 plus but your life is dependent on it. Hein Werner. Use 12 month free interest free PayPal. Had these for 5 years and use them on my suburban also. Use PB blaster, disc grease, locktite and grease were needed. Wear safety glasses and gloves always. 2. Most people buy hub and spindle which is expensive but easier. I decided to remove hub from spindle , cut out race ( grind at a 45 degree angle to weaken, break it out, it but don't cut axle), then press new hub back on. Cheaper route. Beck/Arney Parts. Made in Japan. 2. The brakes and rotor were fine but needed to be cleaned up due to no backing plate or splash shield. Emergencies were fine also. Used old hardware but brakes recently replaced. 3. The most difficult part is putting on the emergency brakes but follow manual and should work fine with the proper tools. Wear safety glasses and gloves always. These springs can reek havoc and poke your eye out. 4. Each hub screws onto the backing plate with a rubber o ring but new one would not hold in right. Used permatex ultra black sealer maker. Worked fine. Keeps out dust dirt, water from bearing. 5. My spindle nut tightens with a push in notch and you need to turn it until its in line with indentation in axle. Marker by color for linerup. 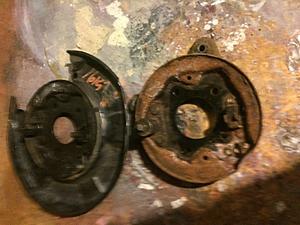 Enclosed are picture of the old and new backing plates to show how bad it was rusted out and some picture of it torn down. I also have a picture from a junkyard where I picked up an old OEM muffler. Mine is in poor shape. $15.00. This one has some rust but may give me 5 years. Note: This is only a guide and this is only for my camry since all are different to some degree. It takes me a long time to complete since I read manuals, sometimes tech manuals, ask toyomoho for advice, consult my mechanics at work and have been working on cars since 16. Don't do it if uncomfortable and not clear on safety rules. There are courses at community colleges. Man is my neighborhood is dead since he fixed his brakes using a scissors jack instead of using a jackstand. Last edited by wdc123; 03-07-2018 at 12:51 AM. Great write up and photos! Most enjoyable to read, thanks! Appreciate your not buying a complete hub/spindle unit to save money. My own thoughts. 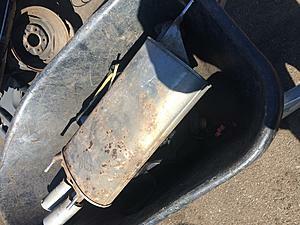 On vehicles that have surface rusted components/areas. Have been using those rust converter sprays to try to manage it on a quick and dirty basis. On jacking up cars. Known a few people who had them fall on them, not good! Dead or lifetime physical problems were the result. As you state, don't ever trust a jack! Use decent jack stands. Block the tires to keep the vehicle from rolling. I have some rigid metal supports I can also put under the car. If the car does fall, the supports will stop it and keep a space between myself and the chassis. Quick Reply: Backing Plate - 1995 Toyota Camry LE Disc.